Today, I am going to talk about the part of the investing process that goes beyond the numbers – qualitative analysis. Qualitative analysis is the most critical part of investing. Investors miss it sometimes in the haste to work with the numbers. What is wrong with looking at numbers alone? Let us take the example of a thermometer and a human body. When you feel under the weather and suspect a fever, you use your thermometer and check the reading. The human body is supposed to have an at-rest temperature of 98.6 degrees Fahrenheit. If you see a reading of 101 degrees Fahrenheit, you might pop a paracetamol tablet to give yourself relief. But at that point do you know whether it is a mild fever or a severe infection in your body? Only a blood test helps. Well, I think this is a good comparison to the business and its financial statements. The financial statements by themselves are important. But they directly do not tell you the entire story. They might even hide certain problems in a company. As analysts, we are comfortable with financial statements. If someone asks you to do a discounted cash flow model, it is possible to build a basic model in a day. Feed in the assumptions and then get an idea of valuation for the stock. I feel that many analysts are also guilty of making the mistake of rushing towards the numbers. Do I have a grip on what this company is going to do ahead? Do I even know what they did in the past? Financial models can very easily be of the Garbage In, Garbage Out (GIGO) variety. They are as good as the assumptions. And how will you make assumptions in financial models? They lie in the realm of qualitative analysis. What are the changes in the sector? What is the growth rate of the sector? What are the competitive forces against the company? Does the company have bargaining power over its customers? Does the company have some sustainable advantages that will help them survive and grow at a healthy pace? What are the risks to present growth? I will take you through an example of a qualitative study. are two battery manufacturers that are listed on the exchanges in India. Please look at the provided links to get an idea of the remarkable growth these companies have had over the last decade. I tried to understand the reasons for this growth in the past. One reason is that auto manufacturer sales have experienced high growth in the last decade as prosperity and disposable incomes have increased in India. I continued searching on the Internet and found this interesting chart. This data is around 10 years old. Too old, one might say. I actively search for old data because it helps you understand long-term trends. 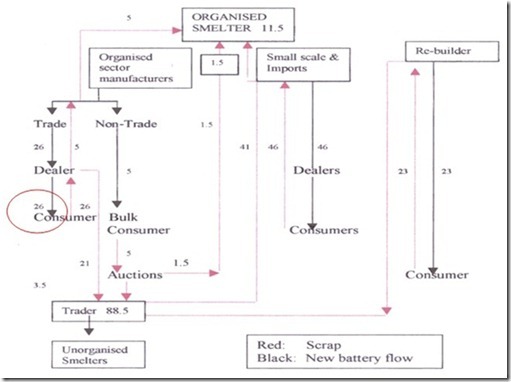 The sources of auto battery sales to consumers (both retail and bulk consumers) are marked in black. The pink lines show the reverse flow of batteries as they are recycled for their lead content. From the black lines it is clear that 23% of batteries were bought from re-builders. Imports were the source of 46% of battery sales. 5% of batteries were sold to bulk consumers. These would be the auto manufacturers. The red circle is the data point that is interesting. 26% of batteries were sold by organized players to consumers. Anything that is not a bulk consumer sale would be a sale in the replacement market i.e. for vehicles already on the road. I make an assumption that the auto manufacturers have been installing branded batteries from organized manufacturers even in the past. I believe this is fair. This data point would not have changed from a decade back. Today, research reports mention that 60% of consumer purchases in replacement market are from organized battery makers. This is an easy data point to check too. Go to a battery dealer in your area and check this. Ask him what happened to re-building. He will most probably tell you that it has reduced drastically. In fact, the dealer that I went to mentioned that he used to re-build earlier. He stopped re-building because branded battery makers strengthened their position in the market. The biggest positive impact on the organized battery makers has been the shift in consumer behaviour. The percentage of battery replacement purchases from organized battery makers like Exide, Amara Raja, and Tata G Yuasa has shot up from 25% to 60% over the last decade. This is not to say that sales to auto manufacturers would not have gone up. The respective pies have increased for auto manufacturer sales and replacement market sales. But in the replacement market, the organized battery makers have eaten into the share of imported batteries and re-built batteries. The understanding of the past helps you build assumptions for the future. You can focus on two big drivers for auto battery volume growth for organized players. You can find out the number of vehicles being manufactured today. You can also find the trend in growth in the past one or two years. This data is available on the SIAM website. SIAM is the auto industry association in India. You need to have a view of the growth outlook. In my opinion it should be muted for cars, possibly negative for commercial vehicles, and at a slower pace than earlier for two wheelers for the next one or two years at least. You know the number of vehicles that are there on the road. You can use Ministry of Road Transport and Highways data. The ones that are already out on the road need replacements ever 3-4 years on average. The ones that get added from auto manufacturer sales will also need replacements. In my opinion, the replacement market shift is a critical point to evaluate. Would organized players grow their 60% market share by a similar amount as they did in the last ten years? That would mean share increasing to 95%. Is 95% too much to expect? I would be comfortable in making an assumption that the shift might not be as dramatic as in the past 10 years. In this entire discussion, we have yet not spoken about prices. We have not talked about expenses and operating margins. You need to work similarly for other pieces in your financial model that fit into the profit and loss statement, balance sheet and cash flow statement. Now imagine yourself creating a financial model for Exide or Amara Raja. It is easy to not think too much, simply extrapolate, and build proforma projections based on the data from the past few years. The important question to ask is whether you want to do it this way. Would you really have comfort on drivers of value in the years that lie ahead without qualitative analysis? Is it not worth finding out? My aim in writing this is to encourage you to start thinking like an investigator when it comes to studying a stock. Try to logically arrive at the key factors that drive valuation. This approach will make you better in your investing process. I will summarize my thoughts. Qualitative analysis should lead your investing process. Get to valuation when you have understood the business. You might want to read my analysis of a bathroom fittings and sanitary-ware maker called Cera Sanitaryware. Read about the channel checks in this complete research report. You will find it interesting.